Commuters and visitors in London will have a new way to travel across the Thames thanks to a brand new cable car system that opens today. Sponsored by Emirates Airlines, the UK's first urban cable car system has the capacity to transport 2,500 passengers per hour in each direction, which is equivalent to 50 buses in the same time frame. The Emirates Air Line project was designed by Wilkinson Eyre Architects and provides spectacular views of the London skyline at 90 meters in the air as it efficiently connects visitors traveling from the city's Olympic venues to existing public transit lines. Transport for London’s Emirates Air Line spans 1 km from the North Woolwich Peninsula to Royals Victoria Dock and is supported by sculptural towers. 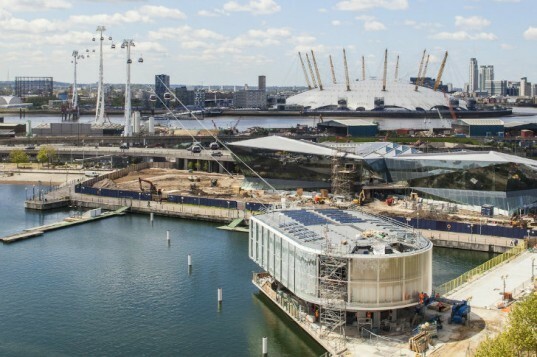 Opening just 1 month before the Olympics begin, the £60 m project is expected to alleviate travel across the river between the O2 Arena in Greenwich to the ExCeL Exhibition Centre. Crossing the river via cable car will take a short 5 minutes and provide views of London as opposed to views outside a bus or underground via the tube and a much longer route. Cyclists will also be able to bring their bike on the cable car to speed their journey. The cable car is open from 7am to 9pm during the week, from 8am to 9pm on Saturdays and from 9am to 9pm on Sundays. Tickets are £4.30 for adults, but only £3.20 for those who use Oyster pay. Planning for Transport for London’s cable car began back in 2010 with backing from and in October 2011, Emirates Airlines stepped in to sponsor the project and provide funding. Impressively, the project has only taken 2 years from conception to completion. The project is expected to be a destination in and of itself, especially during the Olympics. The Air Line is part of the city's plan to to revitalize East London. Transport for London's Emirate Air Line, which opened today, will provide transport across the River Thames connecting key Olympic venues and public transport lines. The aerial journey spans 1 km from the North Woolwich Peninsula to Royals Victoria Dock. Opening just 1 month before the Olympics begin, the £60 m project is expected to alleviate travel across the river between the O2 Arena in Greenwich to the ExCeL Exhibition Centre. Crossing the river via cable car will take a short 5 minutes and provide views of London as opposed to views outside a bus or underground via the tube and a much longer route. Cyclists will also be able to bring their bike on the cable car to speed their journey. The cable car is open from 7am to 9pm during the week, from 8am to 9pm on Saturdays and from 9am to 9pm on Sundays. 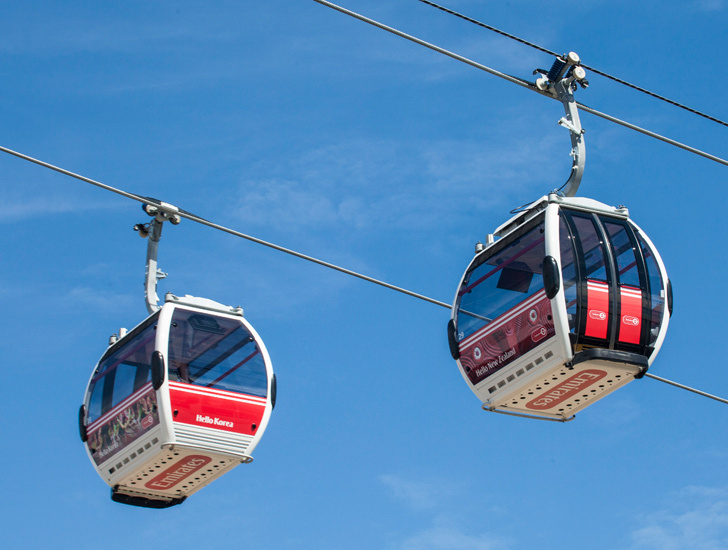 Planning for Transport for London's cable car began back in 2010 with backing from and in October 2011, Emirate Airlines stepped in to sponsor the project and provide funding. Integration of cable car system into Transport for London's network. Impressively, the project has only taken 2 years from conception to completion. Rendering of cable car system by Wilkinson Eyre Architects.